.......53 Buddhas and Me .................My Life Adventures.....: "Just Being Me"
Hello, here I am back in the land of the blogger. I had the best weekend away in Rawson for our scrapbooking weekend. There was lots of scrapbooking - amazingly I did about 10 pages, lots of talking, lots of eating - and I mean lots - and lots of laughing. Isn't it wonderful how laughter can make your insides feel so good. The weather was warm and sunny which is a bonus in Rawson, as it can get very very cold up there. It is so nice to spend time just being yourself - not someones Mum, Daughter, Partner - just being Davine. What a pretty bird. Is that one of those kookaburras I have heard about? An ex hubby lives near Canberra, I think it is. He evidently has all sorts of lovely birds, parrot-types and such, come into his yard. It is wonderful to take a break from the roles of mother, wife, sister, etc -- very theraputic!!! 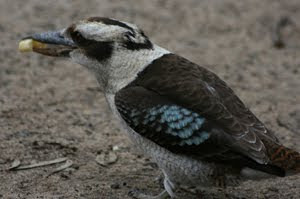 Yeah that is a Kookaburra - they really like our fish & chips. A weekend of scrapbooking sounds like paradise! I'm so glad you had a great time.